Vita Coco Pure Coconut Water. 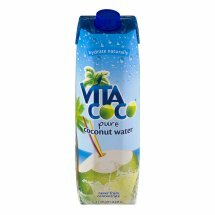 Vita Coco® Pure Coconut Water. 1L (1.05 qt) 33.8 fl oz. • Picked, cracked, and packed at the source. •Jam-packed with naturally occurring electrolytes. •More potassium than a banana (don't tell the monkeys)-potassium helps keep your body properly hydrated. •No fat and no cholesterol (means big hearts&small butts). Coconut Water, Less Than 1% Natural Fruit Sugar, Vitamin C.